When diamonds are being smuggled from South Africa it is up to 007 to find out who is behind it all, this takes him to the United States of America . . . I have to admit that yes I was warned by quite a lot of people that this was not a good Bond film. Yes that is on the back of what I thought was Connery’s poorest outing in You Only Live Twice. This obviously did not fill me with a lot of confidence for this film and unfortunately I am not able to say that all of those people were wrong. They were indeed right it is not a good film by any means. In a very shallow way I will admit that I thought Connery was looking even hotter than usual, yes despite the fact that he was obviously getting older. But still he did and he had that amazing white tux on, I mean I love any suit/tux on a man but that white one wow. Anyway before I get totally distracted and this becomes a totally different post! There’s really not a lot to really say about this film in all honesty it is a poor entry into the Bond series and doesn’t really offer anything new. One of the worst car or chase scenes not only in Bond (so far) but also in film? I mean seriously Bond in a Moon Car and the men trying to chase him crashing all over the place and then those little bike things? Yes I was not impressed with that part at all. If I wasn’t seriously going for it in the sense of having a goal of watching all of the Bond films I think I would have just stopped watching at that very moment. I don’t remember seeing very much of M or Moneypenny and I always enjoy their roles and exchanges with Bond. 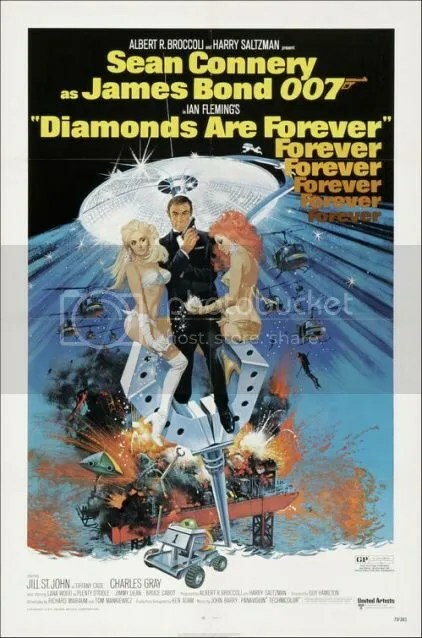 A fake death and a new identity doesn’t really help Bond as he becomes involved in the smuggling of the diamonds to try and get to the bottom of it all. I will admit that I did switch off quite a lot during this one. Which was rather disappointing as was looking forward to Connery back as Bond after the one film appearance of George Lazenby. Maybe Connery should have just left it? Yes I am really thinking that in all honesty. Just thinking he looked hot and having a few good lines was not enough to save this boring story in all honesty. Diamonds may just be forever but this film actually felt like forever! I LOVE this film! It’s so dumb but so funny! “That’s a nice little nothing you’re almost wearing” is my personal favourite line from it and fake Blofeld’s death (not the one at the beginning) is the best worst death in film. Las Vegas could’ve been such a cool location for a Bond film but this one just didn’t pull it off well. Instead they focus on the Nevada deserts. That’s what frustrated me most. What did you think of Mr Kidd and Mr Wint? I think they might be my favourite Bond Henchmen. Also I’d love to see you rank as you go! Would be cool to see the progression of rankings. Kidd and Wint were very good henchmen! I know Vegas sounds like the best location but nothing really cool used for it. I enjoyed reading your post and I see your problems, with this movie. But I still end up watching it all the way through, whenever it’s on the TV. I like the Bond movies and I get drawn in, even to the less compelling films. The only full James Bond film I’ve ever seen and I just remember not liking it! I think you should give some of the other ones a try! I’m glad you agree. This is the worst bond film I’ve seen so far. It was just very “blah” – I feel that is a good one word description as it was so all over the place.